Covalent bonds result from sharing electrons. However, some atoms (O, N, S) attract electrons more and have a slight negative charge around them. Hydrogen attracts electrons more weakly when bonded to O, N and S and has a slight positive charge. Nonpolar bonds are covalent bonds with equal sharing of electrons. e.g. C-H.
Polar bonds are covalent bonds with unequal sharing of electrons (In other words, the unequal sharing of electrons creates two different regions (poles) in the bond, one negative and one positive). e.g. O-H, N-H, and S-H.
Water molecules form hydrogen bonds with other water molecules and with other polar covalent bonds on other molecules. This is because the oxygen atom has a stronger attraction for the electrons then the two covalently bonded H atoms. Because the hydrogen atoms are asymmetrically bonded to the oxygen atom the region around the hydrogen atoms is slightly positive and the side of the oxygen atom furthest from the hydrogen atoms has a slight negative charge. Hydrogen bonds form between the oxygen atoms and the hydrogen atoms of the water molecules. This accounts for the surface tension of water. This property of water is important to understand because water is the most important solvent in living systems. Molecules that are polar or that possess an electrical charge (ions) can more readily dissolve in water. These molecules are hydrophilic (water loving). Nonpolar molecules do not as readily dissolve in water and are hydrophobic (water fearing). Memorize table 2.1. Be able to draw the structure of hydroxyl, sulfhydryl, phosphate, carboxyl and amino groups and indicate their chemical properties. Ions are atoms or molecules that gain or lose electrons completely and acquire a positive or negative charge. Positive ions are cations; negative ions are anions. When ions are dissolved in water they are also called electrolytes because they conduct electric currents. Molecules containing ionized groups are hydrophilic. Biomolecules are synthesized by living organisms and contain carbon atoms. Life as we know it is carbon-based. Carbon can form four covalent bonds and can form an infinite variety of complex molecules with itself and with other atoms. The atoms that most commonly form biomolecules with carbon are oxygen, hydrogen and nitrogen. The most complex biomolecules are polymers. Polymers are molecules that result when similar molecules (subunits) are linked together by covalent bonds. For example, polypeptides (proteins) result from the linking of amino acids by peptide bonds and polysaccharides result from the linking of sugars by glycosidic bonds. Carbohydrates are molecules with carbon, hydrogen and oxygen in the ratio of 1:2:1. This gives carbohydrates the general molecular formula of (CH2O)n or CnH2nOn. The presence of hydroxyl groups (-OH) make carbohydrates polar and readily dissolvable in water. Glucose (C6H12O6) Important source of energy in the body. 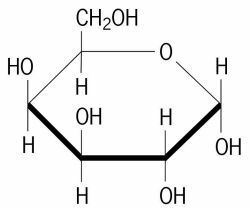 Disaccharides - Two monosaccharides joined by a covalent glycosidic bond. Lactose Glucose and Galactose. Sugar found in milk. Remember terms such as lactation and the hormone prolactin. Polysaccharides - Several monosaccharides joined by covalent bonds. Polymer of glucose subunits. Storage form of carbohydrates in animal cells. Polymer of glucose subunits. Storage form of carbohydrates found in plants. Polymer of glucose subunits Indigestible polysaccharide that forms dietary fiber..
Lipids contain primarily carbon and hydrogen atoms linked by nonpolar bonds. This makes lipids indissoluble in water. However, lipid molecules may also contain oxygen and phosphate groups (HPO4-) that create polar regions. When a molecule contains both polar and nonpolar regions it is described as amphipathic (amphi - both and pathos - feeling). One glycerol (3 carbon alcohol) which forms the "backbone" of the molecule. Three fatty acids which are long chains of carbon atoms bound to hydrogen atoms except at one end where -COOH is found. Most have an even number of carbons, commonly 16 or 18. Saturated fatty acids - contain carbon atoms linked only by single bonds. Unsaturated fatty acids - have one or more carbons linked by double bonds. monounsaturated - fatty acid contains one double-bonded pair of carbons. polyunsaturated - fatty acid contains more than one double-bonded pair of carbons. Phospholipids are lipids that contain a phosphate group. They are similar in structure to a triglyceride except that the third carbon of the glycerol is bonded to a phosphate group. Phospholipids are amphipathic because two fatty acids (tail) are nonpolar while the phosphate group that is invariably attached to another chemical group is polar (head) . Phospholipid bilayer - forms the basic structure of cell membranes. Micelles - spheres whose inner nonpolar region can transport nonpolar substances in water. Eicosanoids are derived from the 20 carbon fatty acid, arachidonic acid. Eicosanoids include prostaglandins, thromboxanes, prostacylins and leukotrienes. Steroids are molecules with a unique three 6-carbon rings and one 5-carbon ring structure. Cholesterol is an example. It is slightly amphipathic because of -OH being attached at one end. Cholesterol is an important lipid component of the cell membrane. Cholesterol is also a precursor to a number of steroid hormones including testosterone, estradiol, cortisol and calcitriol (1, 25 dihydroxyvitamin D3). Proteins are polymers (poly (many) and meres (parts)) of amino acids. Twenty different amino acids are important in humans. These amino acids function as components of proteins; in intercellular communication; and as precursors of other important molecules. Amino acids consist of a central C atom attached to an amino group (-NH2), a carboxyl group (-COOH), a hydrogen atom and a residual group. Residual refers to what "resides" in the molecule after accounting for the key identifying groups. Amino acids become covalently bonded to one another when the amino group of one reacts with the carboxyl group of another in a reaction that releases a water molecule. The reaction is called a condensation reaction and the bond is called a peptide bond. The resulting polymer is a polypeptide. Generally speaking, peptides consist of a chain of less than 50 amino acids while proteins are chains of more than 50 amino acids. However, this is a purely arbitrary definition. The essence of protein function resides in its complex three dimensional structure or conformation. The complexity of protein structure is seen at four levels of organization: primary, secondary, tertiary and quaternary. In other words, 1st, 2nd, 3rd and 4th levels. Primary protein structure simply refers to the sequence of amino acids. Secondary protein structure results from the hydrogen bonds that form between the amino and carbonyl groups of the peptide bonds in the same chain. As a result of these hydrogen bonds the polypeptides may form shapes such as alpha helices and beta pleated sheets. Quaternary protein structure is found only in proteins with more than one polypeptide chain, e.g. hemoglobin consists of four separate polypeptide chains. Proteins can be classified as either fibrous or globular based on their three dimensional conformation. Fibrous proteins form elongated strands that serve a structural or motile function, e.g. collagen, elastins and keratins. Globular proteins are coiled, folded and more compact. These function as chemical messengers, receptors, carrier proteins and enzymes. Proteins are also classified as glycoproteins when carbohydrates are attached and lipoproteins when lipids are attached. Cyclic nucleotides result from a covalent bond that forms between the O of a phosphate group and the third carbon (C3) of the carbohydrate group. Notable examples are cyclic AMP (below) and cyclic GMP. Both are involved in the storage and expression of genetic information. DNA consists of two strands of nucleotides held together in a double helix by hydrogen bonds according to complementary base pairing. G of one strand pairs with the C of other strand (G-C). Review this on your own. A gene consists of a sequence of bases in DNA that codes for a particular protein, proteins or RNA molecules. The code consists of a sequence of triplets each consisting of three bases. Four bases can be arranged in 64 permutations (43 = 64). Therefore, there are 64 different triplets. These triplets are converted to sequences of three complementary base pairs on messenger RNA called codons. The codons specify the 20 different amino acids that will be added to the polypeptide as it is synthesized during translation. Since there are 64 possible codons and only 20 amino acids, some amino acids are coded for by more than one codon. One codon, AUG, is called the initiator codon since it begins the translation process. The AUG codon also codes for methionine. Three codons are called termination codons because, rather than coding for an amino acid, they signal the end of translation. The information contained in a strand of DNA is transcribed onto a strand of RNA. Complementary base pairing results in the G on the DNA becoming an C on RNA; the A becomes a U; the T becomes an A; the C becomes a G.
Transcription begins when the enzyme RNA polymerase identifies a sequence on the DNA called the promoter sequence. RNA polymerase causes the two strands of DNA to separate and initiates the transcription of the base sequence. Free ribonucleotides ATP, UTP, GTP and CTP pair up on the bases of DNA according to complementary base pairing. RNA polymerase catalyzes the bonding of the RNA nucleotides to from a polynucleotide. mRNA undergoes post-transcription processing. A chemical group called a "cap" is added to the 5' end and adenine nucleotides are added to the 3' end to from a poly A tail. YouTube video: shows cap being added and formation of poly A tail Regions of excess bases called introns are removed from the transcribed mRNA and the remaining bases called exons are spliced together. YouTube video: shows intron removal and exon splicing. The processed mRNA is then transported through the nuclear pore into the cytoplasm. The process of peptide bond formation; release of free tRNA from the P site; movement of rRNA to the next codon on mRNA is repeated until the termination codon is reached. The polypeptide is released and the ribosome and mRNA disassociate. This includes cleavage of amino acids (e.g. leader sequence) and addition of molecules including lipids and carbohydrates (glycosylation). 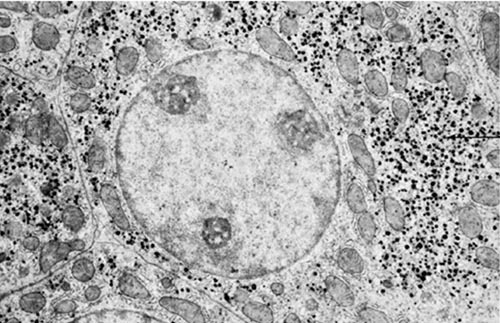 Post-translational processing may occur in the rough endoplasmic reticulum or the Golgi apparatus and after packaging by the Golgi apparatus. Transcription typically is regulated at the point when RNA polymerase binds to the promoter sequence of DNA. Transcription can be induced (turned on) or repressed (turned off) depending upon the cells' need for the protein. Translation can be regulated at the initiation phase by mechanisms that remain poorly understood. Proteins are degraded by proteins called proteases. Proteins can be tagged for destruction by a polypeptide called ubiquitin that directs the protein to a protein complex with proteases called proteasome.